The fascinating thing about Impressionism is that it assumes that a painting is never going to able to recreate reality as accurately as a photograph. Once you leave behind the burden of precision, the artist is free to do what art does best: expressing a feeling, a mood, a state of mind. Impressionism relays more on movement and light than shape and form. The composition is open and the boundary between foreground and background is blurred. An impressionistic painting doesn’t look like a real place but a distant memory, the impression a place leaves deep in your mind. It looks like the blurry pictures from a dream that linger in your mind just before you forget them. That’s pretty much how far my artistic knowledge goes but I hope you get an idea. I was thinking that it would be cool to try to translate that approach into sound design by creating soundscapes to go along with some impressionist paintings. But before we do that, we can’t forget that, in a way, this already happened among a very specific sub-section of sound designers. The ones that limit themselves to a narrow amount of defined pitches and timbres: music composers. I was introduced to Impressionist music by the amazing series Young People's Concerts by Leonard Bernstein which I really can’t recommend enough. If this is the first time you hear about it, just go watch it. There is a whole show about Impressionism. He does a better job than me in explaining it but, basically, when impressionism is translated into music we are trying to express the feeling, the essence of something in a subtle and seductive way. We are not explaining, we are suggesting. This often results in dreamy melodies (whole tone scales are a staple) and the use of exotic and unresolved harmonies. For the most part, composers limit themselves to traditional instruments but they try to get the most from them in terms of timbre. Piano is probably the instrument of choice for Impressionism, using its large range, dynamics and polyphony (pedals are heavily used). As an example, here is what musically happened when Manual de Falla, who was born in Cádiz like myself, moved to Paris and met the Impressionists. Maybe is not its most known side, but sometimes flamenco has a dreamy, exotic quality that I think is perfect for this style of music. And here is a maybe a more canonical example by Debussy. Notice how the melody is usually unresolved. Like in a dream, you don’t really know how you got there and there is no clear conclusion. This music maybe doesn’t sound that different or special to you, as these traits have been assimilated into mainstream music (think jazz) but keep in mind that in that time it was quite a contrast to the musical establishment. If Impressionism doesn’t want to be constrained by shapes, colours or composition, maybe the most logical way to translate this idea into sound would be to forgo concepts like harmony, melody or rhythm. When you do this, only timbre is left and since shaping timbre is kind of my job, it sounds like a perfect fit. My first approach to a Impressionistic soundscape is simple: just create an auditory complement to the visuals, extending the world within the painting to a new sense. Let’s lay down sounds that could exist in the scene and that go well with the feeling it transmits. At first, I thought I would use reverb to blurry sounds together in an analogy of how painters mix colours. But I soon discovered that doesn’t work very well. For the bath painting, I wanted to express a feel of intimacy, a sense of “costumbrismo” which actually was one of the other features of Impressionism: to portray everyday life. Reverb doesn’t help with this because it creates an unnatural space that doesn’t complement the painting but opposes it. 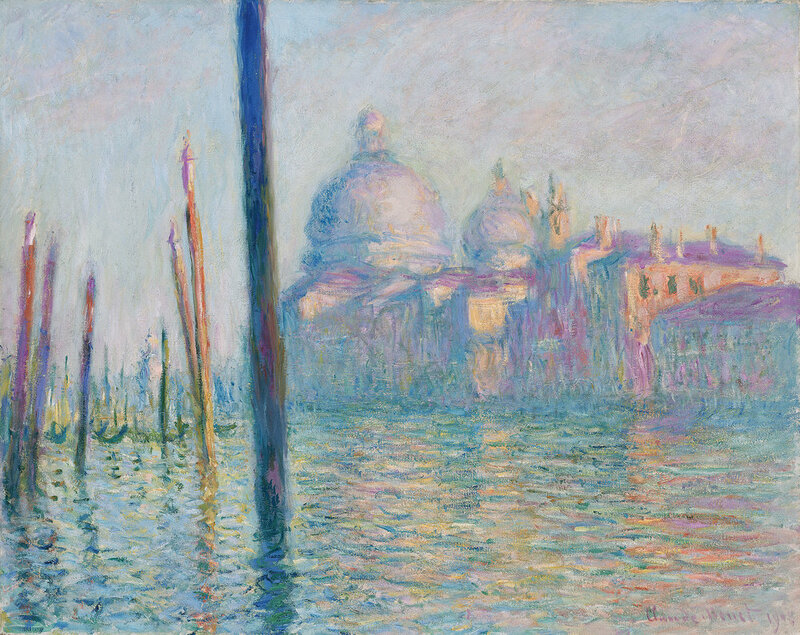 Monet’s Sunrise scene uses more reverb but only enough to match the environment that we are being presented. One more thing was apparent: it helps to have elements in the scene that suggest motion, since most things that make a sound are moving in some way. Here is “Effect of Snow on Petit Mountrouge” by Édouard Manet. Since this painting was created during the franco-prusian war, I decided it could be cool to also tell a little story within the soundscape. I wanted to capture the peaceful calm of a winter snowy day somewhere in Paris. The calm is then broken when distant cannons are heard and the french soldier who is contemplating the scene has to go back to his post. I chose this one because I liked the painting from an aesthetics point of view, it has movement and life. And of course trains are a nice sound design opportunity. After working on these four soundscapes, l realized I was mostly describing the scene and maybe transmitting some of its essence by choosing certain sounds but not being technically impressionistic. I was basically adding a soundtrack to the painting. Their relaxing, atmospheric quality goes well with audio that borders on being ASMR. It’s somewhat ironic that the best complement to an impressionist painting is a soundscape that does the opposite: being descriptive, detailed and realistic. Maybe it makes sense in a way. These paintings suggest instead of being explicit so there is room for audio to add to the experience. Of course this got me thinking about how it would be to create soundscapes for other art styles. Probably the ones that distort reality in different ways like expressionism or cubism could be good candidates. Maybe something worth exploring in the future. But can we use audio in a way that gets to the core idea of Impressionism? To do this, we would need to go more experimental and abstract. We would need to stop using descriptive sound, forget about what you can see and focus on the feeling the painting creates. I created different layers in Paulstretch playing with the window size, pitch shifting and adding harmonics. I refrained form using any “real” audio. Here is “The Cliff at Étretat after the Storm” by Monet. As you can hear I’m getting somewhere interesting. I tried to evoke a warm summer feeling although I’m sometimes dangerously close to the line between being dreamy and being unsettling. My first instinct to solve this was to use music tricks, like pitching layers a fifth away from each other but I didn’t want to relay on musicality too much. This one was created from a music stinger. If you hear both closely, you can tell it’s the same base sound but in a drone, dream-like state. It works well because the musical impacts are stretched creating some movement in the soundscape and some changes in tone. And finally the last one turned out quite creepy, maybe too much for the painting but I like the result nevertheless. I used a combination of layers from Paulstretch, using the tonal / atonal slider to remove most of the “musicality” from the sounds (which were kind of musical). Here is “Moonlight, Isle of Shoals” by Childe Hassam. If this got you interested in learning Paulstretch, I have a blog post about it that goes deep into how it works. It’s cool to work with the concept of “pure sound design” without the burden of mere description but at times it seems to feel too close to atonal music. That last soundscape got me thinking about Ligeti and Penderecki. But is this something bad? Maybe is atonal music which is too close to “pure sound design”. Maybe they are the same thing but looked from different perspectives. In any case, both approaches to the creation of a painting soundscape are valid and worth pursuing, I think. Just the idea of using visual art to inspire audio work is a good way to get your creative juices flowing and tackle things in a different way. Other than that, I was also reminded that sound is not only simple description, it also conveys feelings and can somehow capture the very essence of a place, an action or a character. That’s something to always keep in mind.